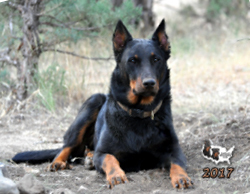 Each year, the American Beauceron Club gathers gathers gorgeous, goofy beauceron images and creates a calendar featuring 12 months of beaucey beauty. Printed on high-quality stock and chock full of handsome shepherds - you won't find another one like it! You can use our contact form to touch base with the Ways and Means committee. We'll be happy to answer your questions!